If you’re a blogger, chances are that you probably heard of the term “Media Kit” before. A “Media Kit” is not just a big word thrown around by the highest paid bloggers out there. It’s something that is vital, even if you are just a “beginner” blogger. Why? Because it’s much easier than feverishly writing down your stats and other blogging info in countless emails to brands and PR companies. So, what is a media kit and how to create a media kit for your blog? A media kit contains all of the important information about your blog and brand and it’s a great tool you can use to sell yourself, your blog and your brand. Your media kit is kind of like a resume for your blog – it is a place where you can showcase your experience, your audience, your accomplishments and your offerings to PR companies and brands. Your media kit is a way for these people to see why they should work with you! So, why do you need a media kit? Many bloggers are on the fence about media kits. There’s a constant battle between having a media kit and not having a media kit. In my opinion, it’s better to have a media kit, than to not have one. The reason for this is, because (1) it shows that you are serious about your blog and (2) it is a very professional way to approach brands for opportunities, etc. (I will tell you more about how to pitch your brand in an email, so subscribe to my newsletter so you don’t miss out. Subscribe option in right sidebar). Your media kit can be anything from 1 to 5 pages, but the average size of a media kit is about 2 to 3 pages long. Personally, for me, the longer the media kit, and the more unnessecary info you added to media kit, the quicker brands will get bored and the less interest they will have in your blog. So, what essentials should you add in your media kit? In this post, I’ve broken it down to the essentials you need in your media kit. These essentials will still pack a punch and will make brands fall in love with you and your blog! First things first, add your blog logo. This is the first impression a potential partnership will have with your blog, so make sure that your logo is clear! Also, and I can’t stress enough how important this is, use a current logo! Your media kit is a representation of your brand, so make sure your logo is your newest one! (I’ve seen many a media kit with a logo different to that displayed on the blog and the incoherence leaves me frustrated and uninterested). Tell the reader a bit about your blog. This is the perfect section to show what you blog about and who your target audience is. Also mention two or three of your most important topics. For me, it would be blogging resources and lifestyle (in that order). For you it might be beauty, fashion and lifestyle. In this section, tell the reader everything you want them to know about your blog! Don’t forget to add a link to your blog here! Now, introduce yourself. And add a headshot! You are the fingers behind the key and it is important to tell brands and PR agencies who you are and why you started your blog. Yes, stats are important. In this section, share all of your stats – from blog stats to social media stats, add it all! It doesn’t matter if you have a million viewers a month or 100, be honest with brands, and share your stats with them. Always ensure your stats are up to date (within three months). I use Google Analytics for my blog stats. Now, tell the brands and PR agencies who your audience is. You can grab this from Google Analytics in the Audience overview section. Brands want to reach your readers, so make sure that they know exactly who your readers are and where they are from. Here’s the fun part. Tell the brands and PR agencies what opportunities you have available. Do you offer reviews, sponsored posts, sidebar advertising? List the opportunities applicable to brands here and also, make it easy for them – list the price here too. In this section, showcase the brands you have worked with before and add some testimonials from these brands. So, your media kit is great and totally in line with what the brand has to offer and they are ready to contact you with an offer… But.. Your contact details are not in your media kit. I can’t even begin to tell you how frustrating it is when I need to get in touch with a blogger and I need to go through hell and high water to find their contact information! Make it clear in your media kit. Give brands and PR agencies multiple ways to get into touch with you – email, contact number, social media handles. Make it easy for them to get in touch with you! I am going to be straight forward with you! Creating a media kit is hard work! It takes many an hour of blood, sweat and (sometimes) tears! But, once you are done, and you have something you are proud of, you will realise that the hard work paid off! Now, instead of typing out a 1000 word email when a brand asks you for information about your blog, you can just send them a friendly hello and attach your media kit, and voila! 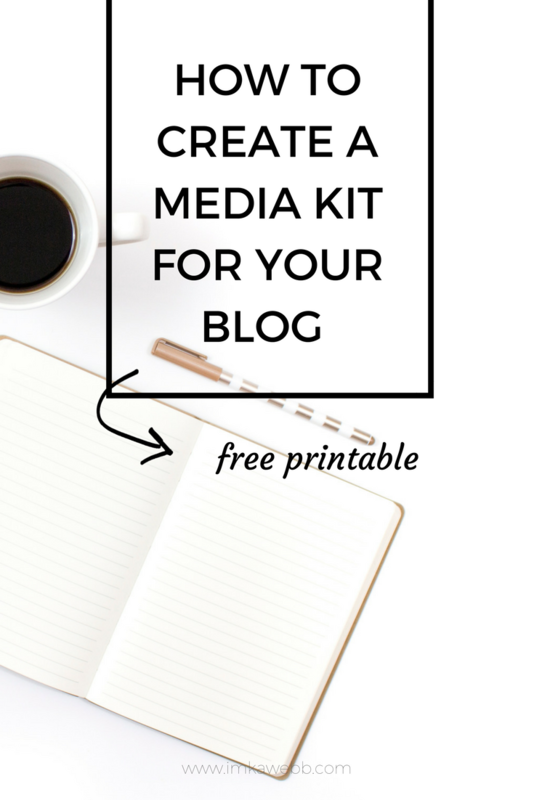 Interested in creating a media kit for your blog? But don’t have the design skills? 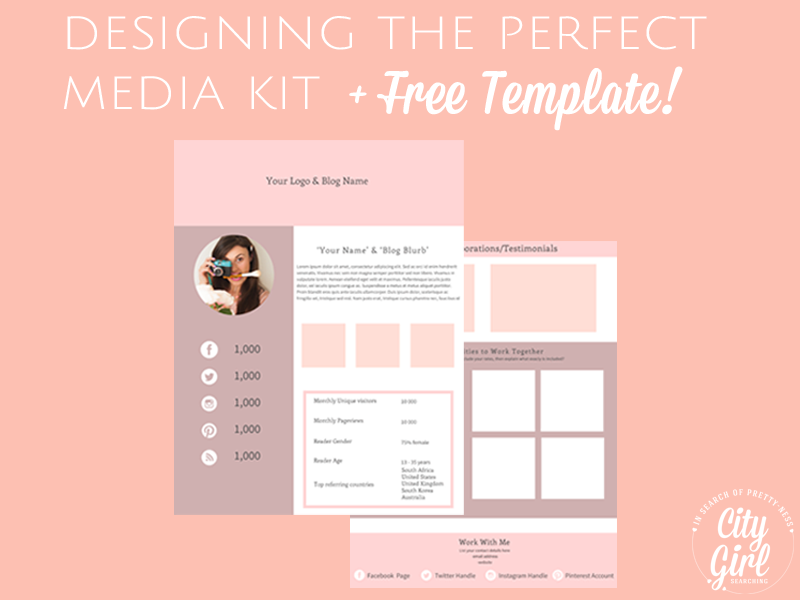 I have collaborated with the lovely Roxy Hutton from City Girl Searching to bring you a stunnig FREE Media Kit template you can use for your blog. Roxy was born in South Africa and now lives in South Korea. Her blog is stunning and she offers great blogging tips and photography advice. I first across her blog when she spoiled us with stunning pictures of her lovely wedding! The media kit Roxy deisgned is beautiful, feminine and perfect for your blogging needs. To download the media kit template (and for more info on how you can design your own media kit), hop on over to Roxy’s blog, or click here to take you straight to her post.